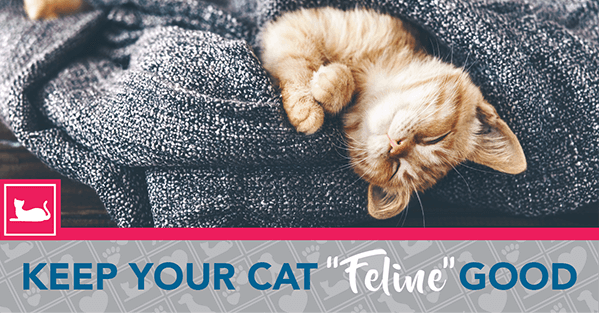 Keep Your Cat “Feline” Good! Pay attention to dental health: Periodontal disease that is left untreated can cause tooth loss, pain, and spread illness-causing bacteria throughout the body. Regular check-ups: Cats are masters at hiding illness and/or pain which is why it’s so important to bring your pet in for annual exams. Twice yearly is best for seniors. Healthy weight: Weight loss or weight gain can be an indicator of an underlying illness such as hypo- or hyperthyroidism. Overweight cats are at higher risk for many diseases. Regular nail trims: Trimmed nails don’t get caught on fabrics and cause painful broken nails. Another benefit: cats with trimmed nails won’t poke you when they knead on you! Regular playtime: Activity gives your feline friend mental and physical exercise as well as bonding time with you! Monitor the litterbox: Increased or decreased urination can be a sign of illnesses such as urinary tract infections or diabetes. Notice a change? Bring your pet in for an exam. Feed them right: Be sure your cat is being feed a diet appropriate to his or her needs. Not sure what’s best for your cat? Ask your vet at your next appointment or just give us a call and we’ll get a recommendation for you. Have more questions about your cat’s health? We’d be paws-itively happy to help—call us at (540) 288-4683.